Many mattress brands will advertise ‘anti-dust mite’ as a benefit of their mattresses. A memory foam or latex mattress is argued to be anti-allergen as dust-mites can’t readily pass through the material as it has a solid structure. There are as always many flaws in this assumption and as expected we want to provide the alternative angle towards this myth! 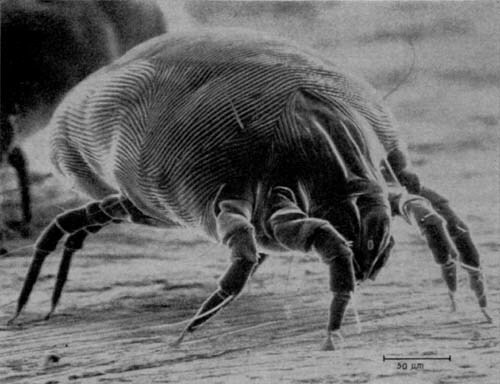 The dust mite is 0.25–0.3 millimetre in length and has 8 legs. Male dust mites live for 10-19 days whilst the female can live up to 70 days and lays 60-100 eggs during her final 5 weeks of life. It’s the faecal particles and dead exoskeletons that are the subject of debate. They depend on water and moisture to survive so any material that can retain moisture will provide an environment for dust mites to live in. The argument used in marketing is that memory foam is anti-allergen, we would argue that whilst there is some truth with this it is not just the mattress that dust mites take up residence, but bedding, sheets and even clothes. So all you are doing is minimising the dust mites in your mattress. Given the figures that 100-500 can live in a 1gm of dust means you may have already established you are in a losing battle!! sneezing repeatedly and or frequent sneezing. Quite simply you can’t. The only way to reduce it is to tumble dry your bedding which will kill the dust mites and uses some specialist anti-dust mite covers. The drawback is that these are only as effective as the routine you use to keep them clean. As you can imagine tumble drying your bedding and sheets every day, to try and keep numbers to a minimum is highly troublesome. Carpets act as a breeding ground and fabric sofas so unless you put down wooden or laminate floors and sit on hard wooden chairs the chances are you’re going to come into contact with them at some point! Our only recommendation is to have a robust cleaning regime, seek medical help if the allergens are becoming troublesome and to do the best you can with it. For most people, they won’t even notice a dust mite problem. Again use your judgement to work out whether the anti-allergen is really a selling point for you or just another gimmick! When you think of mattresses probably one of the last things to enter your mind is that of mould (also commonly spelt mold) and mildew. Yet there are a small handful of complaints that Memory foam mattresses have started to mould. Before you turn your face in disgust, as we first did, let us establish what causes mould. “Mould in the home can usually be found in damp, dark or steamy areas e.g. bathroom or kitchen, cluttered storage areas, recently flooded areas, basement areas, plumbing spaces, areas with poor ventilation and outdoors in humid environments” Wikipedia. Now upon further investigation of this matter, with our detective hats on, it appears that yes a small amount of memory foam mattresses, mainly in very hot humid countries, are showing signs of mould on the underside of the bed. This is not a simple case of memory foam getting mouldy, but more that the conditions memory foam is kept in can sometimes cause mould. Mould thrives on organic matter and breaks it down leading to mould growing and spreading. Memory and hybrid foam mattresses are totally synthetic and so can’t themselves cause mould. Unless that is there is a high level of humidity and other organic compounds found ie dead skin and bacteria! This combination would cause any piece of furniture to develop mould and mildew though so on this occasion we believe the association to be a bit unfair and disproportionate. How can I prevent a mouldy mattress? We recommend that you rotate your mattress monthly not only to ensure even settlement but to ensure there is adequate airflow around the mattress. Also ensuring that damp clothes/towels are not dried in the bedroom or near the bed will help. Leaving a window open slightly to help air circulate is also recommended with any bed if there is humidity in the room. General hygiene, cleaning up spills and keeping bed linen clean and dry will also help prevent this. Please read our Maintenance guide here. Trying to eradicate dust mites is, in reality, a losing battle. What will help reduce the lifecycle and impacts of dust mites are a robust cleaning regime. Clean covers replaced frequently and mattress maintenance will help reduce any impacts. The same can be said for mouldy mattresses, ensuring that rooms are not humid and have good ventilation should help keep your mattress in perfect shape. If you need more advice please give us a call on 0161 437 4419.